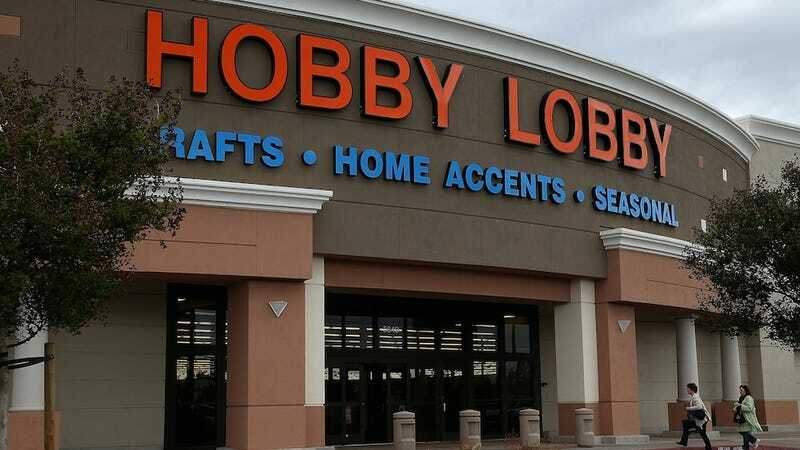 Hobby Lobby — a corporation that values its factually inaccurate beliefs about unborn fetuses over women's legal right to insurance coverage, because God weeps for the souls of the unborn — allegedly fired an employee for getting pregnant three years ago. According to RH Reality Check, Felicia Allen was hired as a part-time cashier in a Mississippi Hobby Lobby branch in 2010. Shortly after she started her job, she learned that she was four months pregnant with her third child; because she hadn't been in her position long, she didn't qualify for the federal Family Leave Medical Act and thus approached her supervisor. "I asked her would I lose my job due to me being four months and only having five months before I have my child. She told me 'no,'" Allen told RH Reality Check. "I felt like everything was OK. I had talked to my boss, and she let me know that everything would be OK. I would still have my job." When she applied for medical leave five months later, her supervisor reportedly told her that she would be fired — but could totally apply again for the same position later on, you know, when she was done giving birth and starting to raise an infant with no job security. So that's exactly what Allen did: she returned and applied just three weeks after giving birth, but she was not given her position back. "I started asking everybody on the job, 'Can they do this?'" Allen said. "And even the assistant manager who had just got hired [said,] 'No, that's not right.'" And that wasn't even the full extent of the awfulness: according to Allen's account, when she applied for unemployment benefits, Hobby Lobby's corporate office "gave the unemployment agency a false version of events, claiming she could have taken off personal leave but chose not to." She was also prevented from suing for wrongful termination because Hobby Lobby had made her sign a binding arbitration agreement upon hiring, which mandates that employees must resolve legal disputes with the corporation outside of court. "They didn't want me to come back after having my baby, to provide for it," said Allen. So, for those keeping track at home: Hobby Lobby cares deeply about protecting the unborn when it comes to denying women contraception coverage under the Affordable Care Act. Hobby Lobby does not care deeply about protecting the unborn when it comes to ensuring that mothers are capable of providing for their new families. Hobby Lobby also does not care deeply about protecting the unborn when it comes to its investment strategy, as the company's retirement plan invests in companies that produce Plan B, IUDs and drugs commonly used in abortions.